Eric Donaldson, who has won Jamaica’s famous Festival song competition seven times, (most recently 1997) will be forever linked with his first big win in 1971, “Cherry Oh Baby” – a smash single from his debut album and famously covered later by The Rolling Stones and UB40. With “Blue Boot,” Donaldson was confident of a second straight victory at Festival. Sadly, although the song had all the ingredients for a second victory, Toots & the Maytals entry, “Pomps And Pride”, also produced by Warwick Lynn, won the contest. Eric failed to take the prize that year, but from now on, he would be known as “Mr. Festival”. 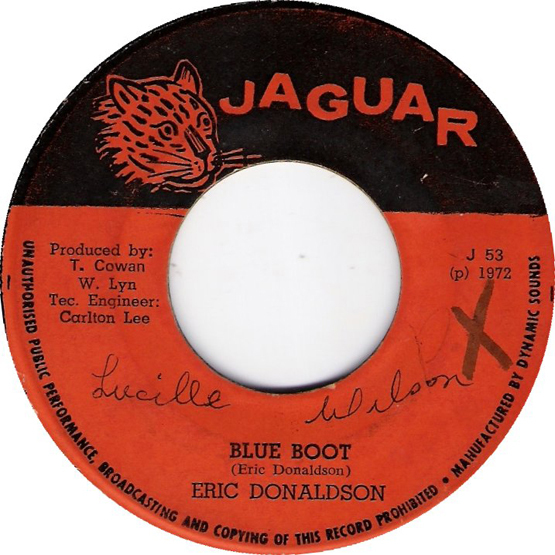 This entry was posted in "Blue Boot", Early Reggae, Eric Donaldson by Zeroto180. Bookmark the permalink.